Alongside a large selection of riser recliner chairs you will find our upright or fireside chairs on display in our showroom. It is always best to come in and try out the comfort of the chairs before committing to your purchase and choosing a colour. Below you will see the Orwell style which we feature on the shop floor most of the time. Please note colours may vary slightly from the images shown. 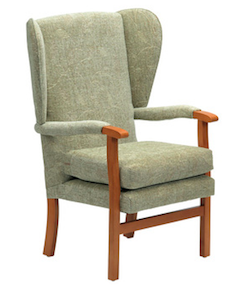 The Cannington Cosi Chair is a traditional fireside chair with elegant scroll arms and wings. With a zipped waterfall back design it offers adjustability in the neck, back and lumbar regions. The Cannington is made of birch wood and is available with mahogany, natural or teak wooden Queen Anne style legs. Available in a choice of three sizes and various colours. A matching footstool can be purchased separately.